A bike rack is generally used to carry a bike or bikes from one place to another. It is basically, used as a bike carrier while traveling by vehicles. It is usually installed on the rear portion of a car or mounted over the back trunk of the car. Choosing a mountain bike rack depends on the vehicle on which it will be installed. 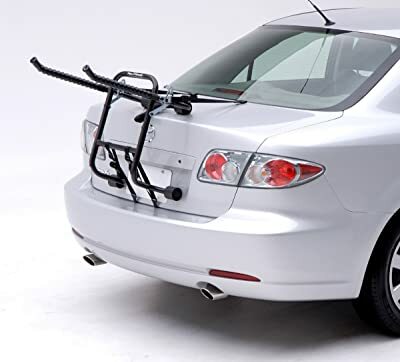 The racks which are installed at the rear bottom of the car through a hitch is called hitch rack and which racks are installed by mounting it over the back trunk of the vehicle is called trunk mounted rack. Both types of bike racks are convenient and easy to install. They also sturdy enough to be loaded with quite a few numbers of bikes as well. The rack can be folded easily while not in use and also, the installation doesn’t take much time at all. There is no dearth of mountain bike racks in the market, but not all of them are of good in quality. A standard mountain bike rack needs to have some common qualities and basic features. Every part of the rack needs to be made of good material to have a good carrying capacity. As most of the time, people tend to carry bikes during their family outing, so a mountain bike rack also ensures the stability, that the bikes or the vehicles do not get damaged anymore. These features make them convenient to use indeed. We did extensive research and compiled a list of best mountain bike rack considering all the basic and extra features that a bike rack needs to possess. This review might come useful while buying a good bike rack. 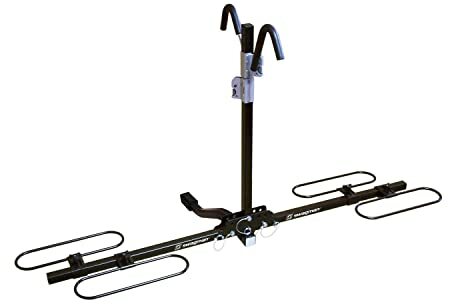 Swagman XTC 2 Hitch Bike Rack is a lightweight mount carrier which is made of steel. The construction of the rack is impressive and well-thought. It has a powder-coated premium finish. The side arms on the mast also can move up and down quickly. Locking hitch pin, security cable, and fat bike tire trays can be bought separately as well. This versatile rack can conveniently adjust to different sizes of bikes. It is also easy to carry. This compact rack can fold up nicely in no time for storage on the back of the car. It takes two minutes to slide the rack out from the back of the vehicle. Once the bikes are installed in the rack, they are secure in all circumstances. The rear trunk of the car can be opened fully even while the rack is mounted. This rack gives a very good value for money and comes with Swagman’s limited lifetime warranty. 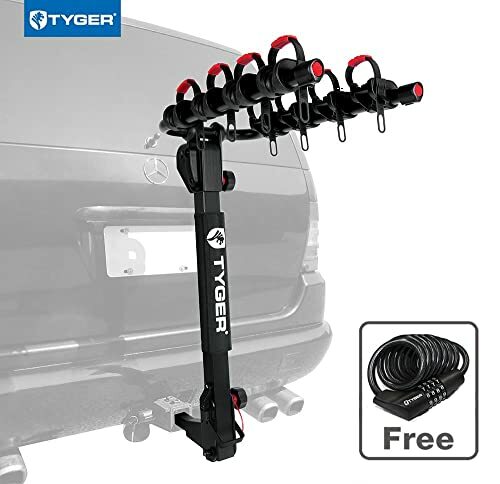 Tyger Auto Bike Rack is the unique and special looking mountain bike rack. It has an exclusive design and very well- construction. It can carry up to 4 bikes with ease. The bike rack, made from solid steel, conveniently assembles within few minutes and needs lesser time to install the bikes. Once the bikes are loaded in this rack, it can be relied upon even when the car is on the bumpiest of the roads. The cradles are movable and can be locked at the spot of own choice. The holding mechanism of the cradles ensures maximum security. It provides the bike’s stability and does not sway or bounce. Though it might seem that once the bikes are loaded, the rear trunk can’t be used without unloading the bikes, but the tilting mechanism of the rack ensures convenient access to the rear trunk very well. This bike rack also comes with a TYGER No-Hassle Limited Lifetime Warranty. 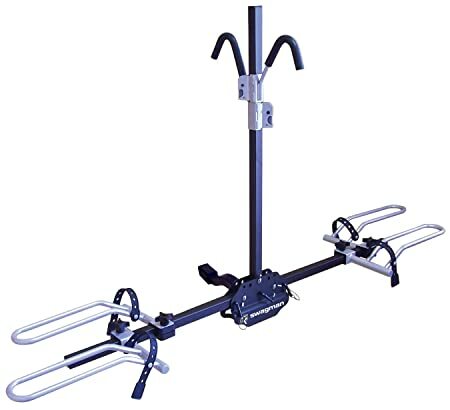 Swagman XC rack is a well made, sturdy and an easy to install a bike rack, that takes five minutes maximum to assemble and load it. The powder coat finish makes it rust and corrosion resistance. The center arm is foldable and allows access to the rear of the vehicle with the bikes loaded. The wheel cradles are adjustable and support different wheel sizes. Adjustable Ratchet arms are also capable of holding bikes of every size. Stability and a solid grip are very important for bikes especially when it can’t be kept on a check once the vehicle starts moving. The holding devices are adequately covered with foam so that the bike doesn’t get scratch on it. 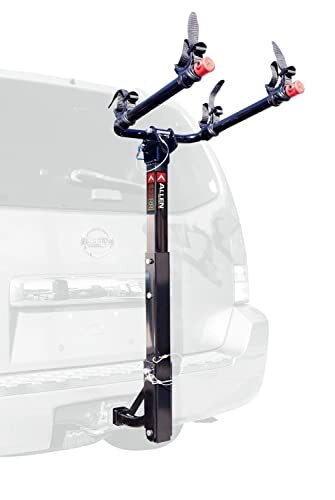 This bike rack gives that necessary stability with an anti-rattle bolt which keeps most of the wobble within the hitch and rack. 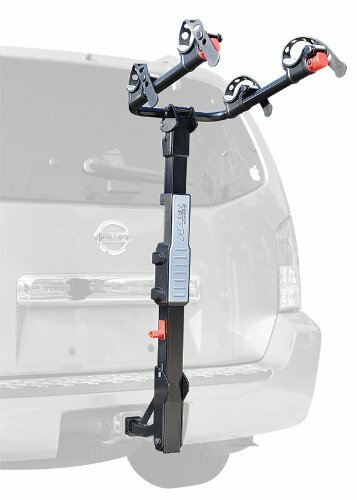 The built-in anti-wobble hitch prevents the rack as well as the bikes from swinging or jiggling. The best thing about Allen Sports Premier Hitch Mounted Bike Rack is the range of carrying capacity from 2 bikes to maximum 5 bikes. It offers not only a different number of bikes carrying capacity but also provides different size of hitches as well. The rack is sturdy enough that can be felt by the look of it. It features a rapid tilt-away mast which can be tilted with just one hand and get done with the work if the rear trunk of the vehicle needs to be opened. Cradle straps are made of durable, high-quality UV resistant rubber which helps to protect the bike even when it’s strongly tied. It hardly wobbles and sways on the road with five bikes on it. It remains stable on the speed bumps due to no wobble bolts. It also comes with a lifetime warranty as well. Like all other Allen bike racks, this sturdy deluxe bike rack is made of solid steel and also easy to install and assemble indeed. It offers folding carry arms which are apt for parking the car occupying very less space. Due to this foldable arms, it doesn’t need to be unloaded from the vehicle and can be kept hitched permanently. The no-wobble bolt allows the rack to be fully tightened and helps the rack to hold the bikes securely without any swinging or bouncing in bumpy roads and pavements. Allen’s Patented tie-down system also allows the rack to hold bike of any sizes. In this system, the cushioned tie-downs remain intact in their place but are able to rotate to adjust with the bike frames and styles as well. The straps and tie downs are cushioned and made of good quality material to avoid scratches on the bikes. It also comes with Allen’s lifetime guarantee as well. Swagman Chinook Hitch Bike Rack is another well-deserved one to have a place in our best mountain bike rack list. It is sturdy and made of solid materials. The mechanism used to build its different parts ensure maximum stability. The bikes are held in place even if the road is bumpy or uneven and also while taking sharp turns. The rack has a particular bar to tilt the rack with the bike to access the rear cargo area. If the rack is not loaded with bikes, fold the mast down and then access the rear truck. The rack can be easily folded up against the rear door while it is not being used. The wheel cradles look very different from other bikes’ wheel cradles. The cradles come with ratcheting straps and protective cushions which saves the bike wheels from damage. For the fat tires, different wheel trays are available to bring them separately. Saris Bones Mount Rack is made of 100-percent recyclable heavy-duty plastic which is one of the strongest trunk mount bike racks available in the market. The injection-molded arms and legs ensure solid built and make the rack corrosion resistant. This rack offers different color options, and some of the colors have a charitable purpose which are apart from other mount bike racks. You can choose the rack matching it with your car color or according to your personality. There are total six straps to mount the rack on the trunk. Two straps are for the top, 2 for the bottom and the rest 2 for the side towards the bumper. It is a pre-assembled bike rack. The width of the support arms and the legs can be adjusted too. The rubberized leg rest protects the vehicle from damage. 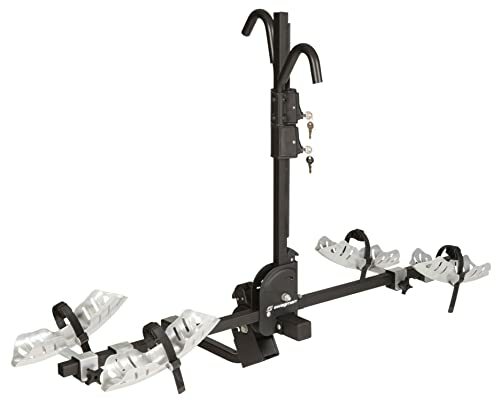 This mount rack also comes with a lifetime warranty as well. 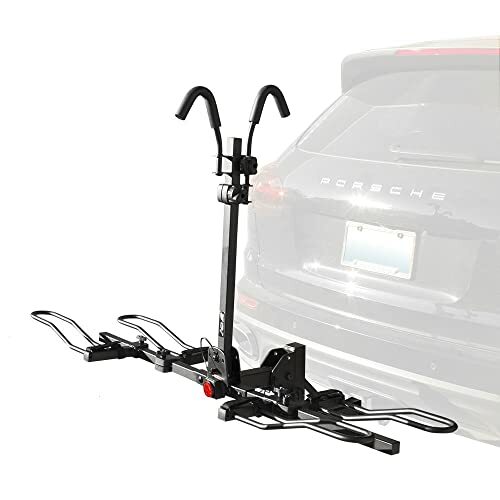 BV Bike Bicycle Hitch Mount Rack is perfect for SUV trunks. The rack can be easily tilted even when the bikes are mounted on it to access the rear trunk. Assembling this rack is very simple and installing it on the trunk is also very easy too. The three-point connection system helps to secure the bikes. This three-point connection system has two tray-style arms on the bottom and one vertical arm on top to hold the bike sturdily and prevents it from swinging. It has a 2-way anti-wobble system which works to eliminate the wobbling between the rack and hitch. The arms are well padded to protect the vehicle as well as the bikes from damage. The rear safety reflector is the unique feature of the rack, which helps to indicate the rack and bikes during night driving. It can be folded upwardly even when the rack is hitched with the bikes as well. This mountain bike rack is a trunk mount rack which can be installed in such a way that the rear trunk can be accessed conveniently. It comes with a feature named multi-position hinges, which is the prime reason for being it such a versatile rack and fitting to every type of vehicle. It comes with a limited lifetime warranty. It offers 14.5-inch spacing between each bike and prevents bike to bike collision. It takes just a minute to load on the trunk and another one minute to disassemble it. It has integrated tie-down strap for extra security. The straps are long and made of nylon which makes it corrosion resistant. It is pre-assembled and also convenient for storage. It is a strong and durable bike rack at a very affordable price indeed. 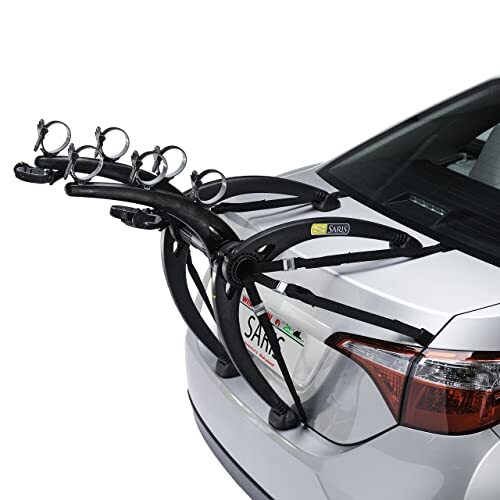 Allen Sports Ultra Compact Trunk Mounted Bike Rack is best for carrying one bike. It can carry up to 2 bikes but is excellent as a one bike carrier. It is compact and ends up too small that it can easily fit in a medium size bag. The carrying bag also comes with the bike rack itself and so it is easy to carry and convenient to store. It’ classic design comes with 3 security straps. Among the three, the one which is used at the bottom of the trunk is flexible and helps it to adjust the bike in such a way that it remains secured from bouncing. The bike sits tilted on the rack also decreases the wobbling as well. This rack is the cheapest one from our list without compromise the quality of the rack. Like all other Allen bike racks, this one also comes with Allen’s lifetime warranty. Our review of the best racks now comes to an end. As we know, a mountain bike is a valuable product to the biker. 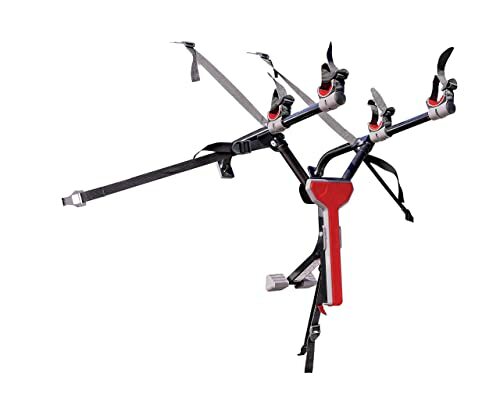 So, if you don’t want your rack locks to fling open, and your bike to flew away in the middle of the road, then you need to choose a best mountain bike rack which is good in quality, well built, sturdy enough to ensure great protection of your bikes and convenient traveling as well. This review will help you to get the best one. Remember, buy a product only when if it fulfills your specific requirements. Before buying your bike rack, have a look at this review and make your own analysis by assembling your requirements. Hope, it will help you to make the right decision and be able to have the perfect rack for transporting your mountain bikes.